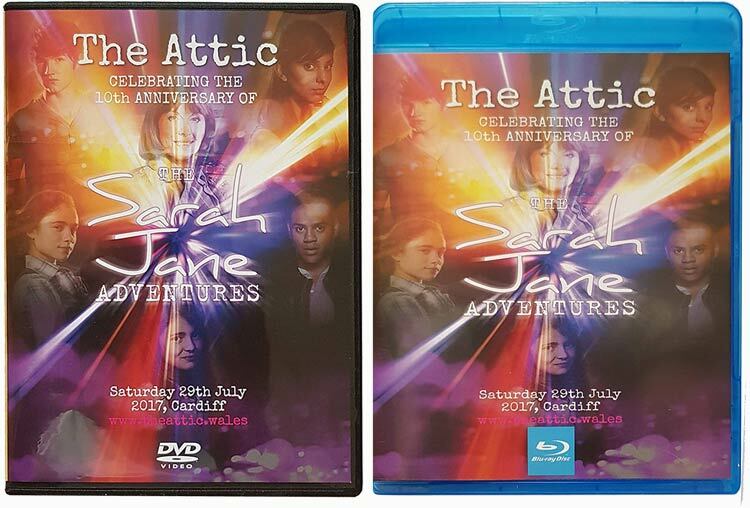 The Attic was a reunion of the cast & crew of the hit CBBC TV show ‘The Sarah Jane Adventures’ to celebrate the shows 10th anniversary. It raised over £6000 for Ty Hafan children’s hospice based in Penarth near to where the show was filmed. A portion of this sale will be donated to Ty Hafan. Guests on the day included: Tommy Knight (Luke Smith) Anjli Mohindra (Rani) Yasmin Paige (Maria Jackson) Sinead Michael (Sky) Mina Anwar (Gita) Katy Manning (Jo Grant/Jones) Paul Marc Davis (The Trickster) Phil Ford & Joe Lidster (Writers) Gary Russell (Script Editor) Sam Watts (Composer) John Leeson & Mat Irvine (K9) Scott Handcock (Runner) Richard Wisker (George in ‘Lost in Time’) Brian Miller (Elisabeth Sladen’s husband) The event was hosted by CBBC presenter Chris Johnson and Scott Handcock of Dr Who Big Finish fame. It was supported before and on the day by popular YouTubers Tom Dix (Epic Who) and Zack Attree. This Dual Layer DVD-R has a running time over over 7 HOURS and features the complete stage panels from the day filmed in superb quality from the very front with unobstructed views and direct feed from the microphones used. Aside from reuniting the cast the panels cover a range of on and off screen memories, the careers of the cast, memories of Elisabeth Sladen, the music of the show, writing and producing the episodes etc. During the day members of the cast took part in a special version of ‘The Gameathon’, previously used a couple of times by the CBBC Sarah Jane Adventures website. For those who don’t remember the original it’s essentially a ‘sports day, activity, challenge’ event. It included all sorts from sack and space hopper races to maths challenges and isn’t to be missed! This event and the DVD is unofficial and not endorsed or supported by the BBC. Does anyone know if the Bluray is still available? I have this DVD and it’s amazing. 100% amazing! A wonderful tribute! Will it come sealed or not? The picture on the listing looks like a used dvd? It’s a dvd-rom therefore manufactured on demand when you order. It’s probably being sold by those responsible for filming the reunion in the first place so i wouldn’t expect it to be sealed. You order a copy, then they run off a disc, put it in a sleeve then send it to you. So frustrating. The only place that is selling it is amazon uk and they won’t ship to Australia any more. Same thing, can’t be sent in France by the (only) seller. Unfortunately the problem isn’t the seller (you can see he has international as a delivery listing), but rather amazon nowadays refuses to send outside the UK and same with Amazon US. This is a new thing the came in from 1 July 2018. The warning message internationals get when you try to put it in your basket is amazon refuses to send it and not the seller. If anyone has any alternative solutions please post here, thanks. Great minds think alike. I already messaged the person on ebay UK to see if they had any copies as there are international people wanting copies. The good thing about the eBay lister is that they are actually giving a percentage to the original charity. I am sure they ran out of stock like you said. What is even weirder is that the web address listed on the front of the DVD is no longer in use and wayback shows there were no resource links on the site anyway. Haha, snap. They replied to me too – which was very nice of them. I don’t think they will find a way around amazon uk. Both the UK and the US stopped selling to some other countries from 1st July to avoid paying the local goods tax in each country. Fingers crossed the seller can list them somewhere. If anyone is interested, I’m in the UK and can order it from amazon then post it internationally provided you guys have PayPal. Thanks so much Daniel if you are reading this. That is just lovely of you to offer. Fortunately the seller has just started listing them on ebay. I really appreciate your offer. Just wonderful, thank you. Will this only be available from Amazon?